L: 87" x W: 40" x H: 40"
Cole Leather Power-Reclining Sofa This Cole leather power-reclining sofa in dark brown is a masterful composition of luxury and comfort. Luxury lives in its 100% leather everywhere the body touches and elegant nailhead accents. When you're ready to relax, this leather sofa features 2 chaise-style reclining seats that reduce pressure points on your legs and heels. The cushions are even customized for your comfort: the seat cushions are scooped, and the back cushions are channeled and contoured for cradled support. This Cole leather power-reclining sofa in dark brown is a masterful composition of luxury and comfort. Luxury lives in its 100% leather everywhere the body touches and elegant nailhead accents. When you're ready to relax, this leather sofa features 2 chaise-style reclining seats that reduce pressure points on your legs and heels. The cushions are even customized for your comfort: the seat cushions are scooped, and the back cushions are channeled and contoured for cradled support. This was a higher end purchase, for my wife and I, to be used as an everyday sofa. We expected the fixed sofa cushions to depress slightly over time, but within less than 2 months one reclining seat (which receives the most use) was greatly indented. The R & F Sales person did not mention that this would occur, so we were taken by surprise. Actually, we thought that a spring was detached! However, during a service call the R & F technician said that heavy seat indentation was normal and there were no loose springs. He also said that the deep seat sagging is expected on all 3 of the seats, so we now have that to look forward to on the other 2 seats. Due to the poor support afforded by the sofa, knee joint pain is now a reality. In addition, after only 5 months the top coat of leather has shown signs of wear and use in multiple places, which could only be touched-up by a qualified R &amp; F technician. From now on this will be a $50 cost every 6 months for the R & F tech to touch-up the leather. The sales person told us the fabric was quite durable, only requiring a wipe with a damp cloth when needed, so regular &amp; costly sofa maintenance was not anticipated. Lastly, since this is not a flat sofa, lying comfortably across it is a pipe dream, which also differs from what we were told by our sales person. If we had known that the Cole Power Reclining Sofa had so many functionality issues, we would not have made the purchase. It is 1 year later and we are still as happy as day 1. A beautiful Sofa- much nicer looking in person and oh so comfy. My husband DID NOT want to put money out for new furniture, but once I dragged him into the showroom and he sat in the recliner, he let out an "Awe-yeaaahhh". I knew he approved lol! So easy to clean and stays clean- even with 4 long hair cats whose fur was ALWAYS ALL OVER our last microfibre sofa. Fur does not cling to leather and this leather and vinyl resists claws better than I thought it would. My cat's claws ruined our last sofa, but surprisingly, I have not had the issues I thought I might- even a year later and am glad we went for the leather because it always looks good. If there is a con for us- it would be that bucket seating on the sofa does not make it very comfy to lay across, although I have layed across it just fine, I can see how some may not find it comfy to use in that way. We ended up buying the sofa and 2 recliners as well as the Dallas coffee table and the Phoenix TV console, which even though they are from 2 different collections, they are so similar - the main difference being in the feet. I was fine with that (I had to compromise with my husband- I wanted Dallas- he wanted Phoenix-)They look great together and we have new living room furniture that we enjoy everyday. We also bought an extended warranty and they will come out and restuff it every so often- which is does not need at all. It is still as stuffed as day 1.The arms on the Cole are rolled, as opposed to those flat pillow type of arms, so they stay nice and will stay nice for a very long time. The warranty will also take care of most of life's little mishaps. The delivery guys were great! This sofa also comes apart so it was able to fit through my door. We took advantage of the 0% financing for 4 years and are making affordable monthly payments. I love the look of this couch! This couch is gorgeous and very comfortable. It was exactly hat I as looking for but you definitely have to buy the warranty because it easily scratches and gets spots on the leather. looks great, very nice, well worth the investment. Sofa is very comfortable to sit own. Do not recommend laying on. Well built appear to be durable. When we first went into showroom we had no intention of buying a leather furniture set. Very happy we did. Looks beautiful in the living room along with the other pices and tables. This sofa reclines to an alomst-laying position and is comfortable using the reclining feature. It is not comfortable to lay down accross as you would a regular sofa. The leather seems durable and we like the electronic reclining feature. These are our first leather couches. We have had them for a couple of weeks and they are very comfortable, look good and the power recline is fantastic. My husband picked ordered 2 full size sodas because of the comfort. I like them because they look good, feel good, and they are relaxing for my elderly parents when they visit. I recommend them. I did not give 5 stars because out of the two sofas, one is not in front of a wall, so the reclining flaps are visible. When someone is reclining, you can see the metal bar underneath. We are currently looking for a long sofa table to hide this. It may not bother some people. We purchased two of these sofas and they are the most comfortable sofas we have ever owned! The leather is so soft but durable enough to hold up against our three large dogs...who love it as much as we do! Love my new furniture. Highly recommend it. The delivery guys were early which was good as I didn't have to tie up my day. Very nice guys. Was extremely pleased with the purchase of this sofa. The leather is soft, and the design is so comfortable. 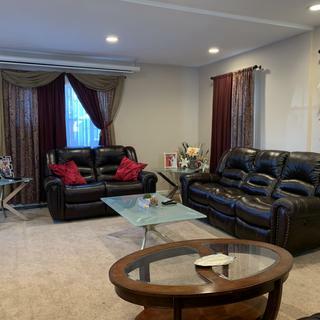 Its a nice dark brown color, and is on the smaller size and doesn't take up so much space compared to other leather sofas we have had. We purchased 2 of the leather power reclining sofas I love the power feature. It is great to stop it in the position that is most comfortable for each individual person, esp. if you are shorter. We are happy we went with 2 sofas instead of one love seat. We really enjoy having the extra space between the reclining pieces to put the remotes, books, etc. and to have the room for a 3rd person to sit when we need it. Leather is soft and colors match well. We just had a few problems getting one of them defect free. Raymour and Flannigan quickly resolved the issue and reshipped the item much to our satisfaction. The furniture leather sofas look great in terms of color and design.....loves the comfort and elegance in the living room. We love the look and the feel of this leather. It's very comfortable to sit in. Very happy with the look and quality of this sofa. Fits great in the room and is extremely comfortable. Nice clean lines and not bulky. The power recliners are quiet and give a large range of comfort. We have this couch and matching chair in our Formal living room and we love it! It's attractively made, comfortable, durable and easy to clean. We absolutely love this set. With so many oversized and fluffy pillow couches with consoles on the market today, it was a gem of a find. It has all the traits we were looking for, and it looks gorgeous in our living room with the gray Ashlen rug. This is such a comfortable sofa. And it is beautiful. Delivered on time and in great shape. Highly recommend checking this one out. We absolutely love this sofa recliner! It is all we are using now. Very comfortable and relaxing. I am not even using our old recliners. When you can live on the sofa, why not? Morning til night. If you have company, this would be a great place to sleep. Our guests absolutely loved this sofa. Great choice. Even though it was a replacement of my broken sofa set with new ones. With platinum protection they replaced the sofa and allowed to me to pick new sofas by paying additional difference amount. Excellent - 5 Stars Quality and service! This is an amazing product! Fast shipping and excellent Quality! Raymour & Flamingan Still surpassing expectations. Highly Recommended store! I do not regret have them as my furniture supplier for all our locations around East Coast. Love, love our new Cole recliner, reclining sofa and loveseat. In the Manchester store there wasn't another reclining leather sofa even close in comparison. We spent the extra *** dollars for the power recliner on the sofa and so glad that we did. Definitely worth the money. It was stiff for a few days, then broke it nicely. So happy with the purchase! Great product, customer service, and delivery timing! This sofa has transformed a room into a living space. It's sculptured design and soft leather embrace the most skeptical among our family members. The smooth reclining motion satisfies individual needs and produces a discernible "ah." Long-lasting quality and comfort have found their mascot. Awesome thank you! Rachid is the best! Just had the sofa delivered and it is comfortable. Sales gal was very helpful and delivery guys were great. So far so good! Very comfortable. Enjoy resting and putting my feet up. Fast power recline. Highly recommended. I love our new cole sofa. We had a very knowledgeable young man helping us make our selection. The store delivered it on time and everyone involved was very courteous. I'm very pleased with my purchase. 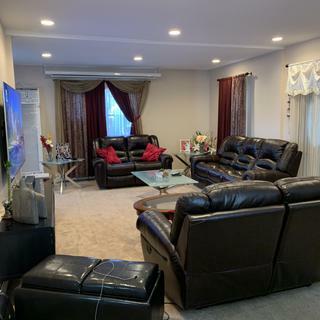 We just bought this sofa and love seat to replace an old sectional......We absolutely love it and the experience was so effortless......Morris was so helpful and everyone there was so nice...…….. I bought two of these sofas 6 months ago, and I'm really happy with my purchase. I was looking for sofas with great back support and this was the best choice at the store. I can work with my computer, have the reclining up to rest my legs, and enjoy watching TV. The leather is beautiful and elegant. Too comfy sometimes that I fall asleep. Just add a throw and relax. I highly recommend this sofa.! Great sofa, super comfortable. Service was awesome and they were so helpful. Will be back! I would highly recommend this sofa! Linda G was our rep. and she was very helpful. She showed us several different sofa sets and and did not pressure us. Linda answered all my questions and if we came across a situation, she took care of it. As for the sofa set, my husband and I are very happy we purchased it. We both are enjoying the comfort and the style of the set. So comfortable and looks great! Recommend. We love it, enjoy it. We are happy with the purchase. This reclining sofa is perfect in our room. Along with the matching loveseat it makes our room look complete. It is both comfortable and stylish. I would recomend to family and friends. I would also recomend Raymour and Flanigan, the quality and service is great! I'm only giving it 4 stars for now since the room it's in won't be completely decorated for a few more days and I haven't really had the chance to use it yet. I really like the look and feel of it and the little time I have sat in it, I found it to be very comfortable. I wasn't sure I would like the whole leather, masculine look and a recliner to boot... so not my style, but my partner really likes this style furniture and I agreed to go all in. I'm very happy I did. We purchased three pieces, one sofa and two loveseats. and I'm very please with each piece. Sales gal was very helpful and patient, not pushy at all. Delivery took 6 days, not 3 as advertised, we only live about 30 miles from the store, couldn't understand that. Delivery men were prompt and professional. In and out in 15 minutes. We will enjoy our new furniture for years to come. We have kids and teens in the house they're very happy with the feel and comfort too. 4 stars only because of the delivery delay. This couch incorporated a lot of the features we only found singularly in four Types: real vs bonded, contoured vs smooth, depth vs style. We found it comfortable for 3 boys over six foot and two hundred pounds. The couch that arrived was a bit firmer than the one we tested in the showroom, but that was to be expected. Very comfortable and really enjoy the ease of the power control, being able to adjust to various levels of reclining is such a plus. Overall very pleased with this furniture, though wish it was available in other color choices or micro suede. Very happy with this sofa. Very confortable. I will recommend this product. It is our first leather sofa and we are very happy with it. Big enough to seat 3 big men but sleek enough to fit through a door for a delivery. Company coming 8/24/2016 to look at & hopefully repair back flaps on lower back of sofa - wrinkled & not in alignment with the velcro strip - but we are satisfied with the power reclining aspect. What is the specification for the motor(Voltage/Hertz/Wattage) for Power Recining Sofa?||If I take it to India then what specification of Step Down Transformer is needed? BEST ANSWER: The sofa will plug into a standard 110v outlet. There are transformers available, though I do not know the specifications for India. For sub-continent the converter is needed as they use 220v there. Can the sofa be taken apart for delivery? BEST ANSWER: The Cole Leather Power-Reclining Sofa does have removable backs on the 2 side ends. BEST ANSWER: This collection is made in China. I have a door way that is 36W by 80H will this couch fit through that opening? BEST ANSWER: Yes, the couch comes in 2 pieces. Our door is the same size and the delivery people had no problem. Yes it will...they will probably just have to remove the back piece head-rest for the 3 seater. Yes, the couch will fit through a standard 3'0" x 6'8" residential entry door. Can you get just one recliner in this sofa ? BEST ANSWER: The Cole Leather Power-Reclining Sofa includes two recliners, on each end of the sofa. How long is the power cord in back of the reclining sofa? BEST ANSWER: The power cord is 6' long from the center back of the sofa. Who is the manufacturer of the Cole Sofa? BEST ANSWER: The Cole collection is made by Bellanest, our Raymour & Flanigan exclusive brand. Does this sofa come in other colors and/or fabrics? where is the power cord on the sofa? BEST ANSWER: It is in the back of the sofa. how much is the carpet in this photo? 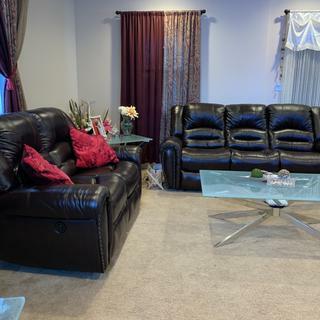 BEST ANSWER: This sofa is shown in two different photos with two different rugs. Please call the online sales department at 866-383-4484 option 3 so we can get further information in regards to the correct rug and look up the price for you. What's the name of carpet in picture, I have bought this set and would like a carpet to match? BEST ANSWER: I'm sorry. The rugs pictured are discontinued and no longer available from the manufacturer. I would like to know if there is a weight limit for a person to fully recline on the sofa's two recliners. BEST ANSWER: The recommended weight capacity is 225 lbs per seat. Client want to know type and what grade leather is it?? BEST ANSWER: The Cole Leather-Match Sofa features top grain semi-aniline leather on the seating surfaces and tops of arms. This is matched with a vinyl on the backs and outsides of the arms. Grading systems are solely based on cost. This vendor only has one cost for their leathers so there is no grading system. how many inches does the sofa need to be from the wall? BEST ANSWER: The Cole Leather Match Power Reclining Sofa is a wallhugger, so it only needs to be a few inches away from the wall, to recline. What type of leather is this couch made of? Is it top grain leather? Is it aniline leather? When I was at a Raymour & Flanigan store earlier today the saleswoman told me it was top grain aniline leather but I don't see that anywhere in the description. BEST ANSWER: The Cole Leather Match Power Reclining sofa is 100% leather everywhere the body touches (sofa's body and arms), & the back and sides are covered in matching vinyl.